Click here to skip the review and order your TwinTrexx Baby Carrier with FREE shipping! There are several functional twin carriers out there that accommodate two babies at the same time. What's important, however, is how much comfort the carrier provides to the mom and how well it distributes the weight of the babies. With that in mind, we tested several carriers and found the one that serves the purpose very well - TwinTrexx Twin Baby Carrier. TwinTrexx is very flexible, versatile in use and easy for moms to put on and take off without help. It works well for delivering the same soothing rocking effect that a single baby carrier does. The carrier distributes the weight of the babies evenly between two sides of your body. You can wear your babies either on the left and right side, or on the front and back (see videos below). This feature lets you change positions often to prevent hurting yourself from wearing your babies in the same position for a long time. I also found it very convenient that there is an outside pocket at the top of the carrier. No need to look for a spot for your phone or keys. The fabric of the carrier is very soft and pleasant to touch. All straps are padded, all edges are soft. All fasteners are secure adjustable buckle straps, so you know that your babies are held in place steadily and securely at all times. TwinTrexx carrier complies with US and international safety standards. 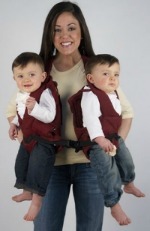 This twin carrier is designed for babies 7 to 25 pounds each. Adjustable buckle straps also make it suitable for various size moms and babies. Good To Know: Keep in mind, that since many multiple babies are born prematurely, not every baby weighs 7lbs at birth. Maximum weight of 25lbs is more than enough for the carrier to last as long as you need it. Think 50lbs total weight. Don't think you would ever want to pick up and carry around more than that! There are 4 major ways (see videos below) how you can wear your TwinTrexx, which helps prevent injuries to your back and shoulders. Another great feature is that TwinTrexx easily converts into two single carriers - perfect for times when your twins need to be in two different places at the same time. 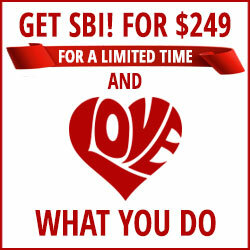 No need to buy additional single carriers to accomplish that! Attach two carriers together with the straps that go criss-cross on your back, and carry both babies simultaneously facing inward. First video shows how to put on the double TwinTrexx Carrier. Second video describes inward-facing positioning. Turn the carrier around, place each baby in a carrier, place babies on your lap facing outward, put on the carriers with the straps going criss-cross on your back, and carry both babies simultaneously facing outward. Place both babies in their carriers, place one baby securely on a sofa behind you. Put on the other carrier on the front with the baby in it either inward or outward facing. Buckle it up. The other carrier will go on your back. The baby in it should only be worn facing inward (facing your back). Pick up this second carrier and put it on as you would a backpack. Note: You will need a surface to sit on and put your babies on while putting on the carrier, so plan accordingly. Getting used to carrying two babies takes practice. TwinTrexx Carrier makes it easier, but you may need help preparing to wear your twins for the first time. Once all straps are adjusted for your posture and weight of the babies, you can put it on on your own. It gets easier every time you do it. TwinTrexx Twin Baby Carrier provides great flexibility and mobility whether you carry your babies around the house, go for a walk or run errands. I loved testing my TwinTrexx and I know you will enjoy using it! I've searched several sellers to find the best price for you and once again Right Start beats all the competitors. They have the lowest price on TwinTrexx, provide excellent customer service and offer FREE shipping! Click here to order your TwinTrexx Baby Carrier with FREE shipping!